One wonderful aspect of terrariums is their versatility. Terrarium enthusiasts design terrariums in a variety of themes and moods- from whimsical and fantastical (think mini faeries and glitter), to scientific or historic themed (beakers, test tubes and steampunk) or modern and angular. Check out these geometric terrariums by Ricardo Espinoza. 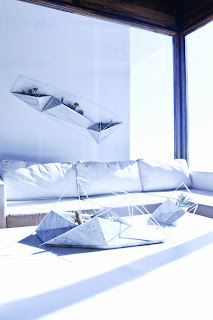 While the angular, gem-facet look is becoming very common in terrariums - I haven't seen the wall-mounted geometric terrarium like the one in the photo. See more at mocoloco.com.